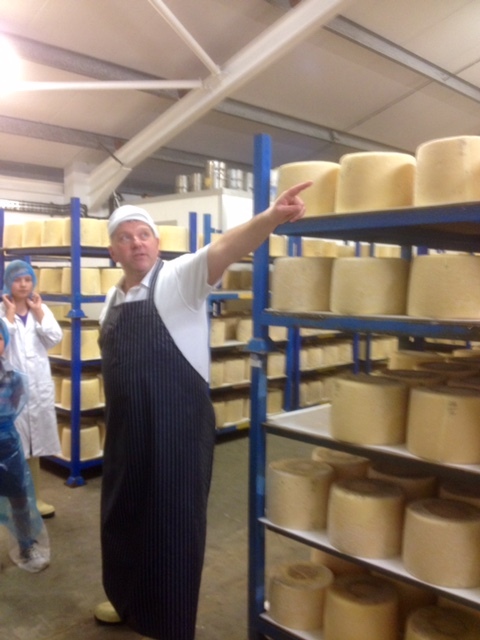 Mid October, a staffing crisis hit the Baron Bigod team and since I was around, knowledgeable and looking for extra work, their head cheesemaker Mark Mitchell suggested I joined the team to help with Christmas production. I was happy to be a part of it. Partly the Baron Bigod make is quicker, more physical, has more manual intervention and so is quite different to the St Jude make and that quite appeals to me. Partly, however, it plays with a line between acid drainage and rennet drainage that also quite appealed to me to learn about. ‘You won’t know what’ s hit you,’ said Mark, as I started my first emergency shift. He had promised 2 shifts of at least 10 hours a day but we were already short staffed due to illness & bereavement. 2 shifts ended up being more like four or five on top of my St Jude making duties too. It was a test of endurance in some ways but, to be fair, not the first time I’ve done a workload like that. Cheese retail has trained me to pull out the stops when the Christmas rush is on. When you’re cheesemaking, your Christmas rush is in October and November (for soft cheeses) whereas your retail Christmas rush is, of course, at the end of December. As it happens I did one of those too this year. Mons Cheesemongers. But that’s another story. On the first make day of the week the Baron Bigod routine starts at 6am in the dairy, sterilising the moulds, trays and setting up the draining tables and sterilising the vats ready for the milk. Before this, the milking team will have added starter to the milk that is collected in their tank and which will then feed by gravity through the pipe into the vats at 7am. Starter is usually added as milking starts at about 4:30 to 5am so it can ripen in the tank for a couple of hours at least before it’s piped across to the dairy. Starter can be added in powder form although depending on the time of year either DVI starters bulked up in skimmed, sterilised milk overnight or a specific starter culture designed to be bulked up may be used. At the moment, they are experimenting with their usual DVI starters but incubating them overnight. In September when there’s a higher proportion of new lactation milk, which has higher antibodies and tends to play havoc with their usual starter cultures, a specific culture designed to be bulked up will be used. Currently they are experimenting with what quantity of milk to incubate into as it affects the speed of the make. 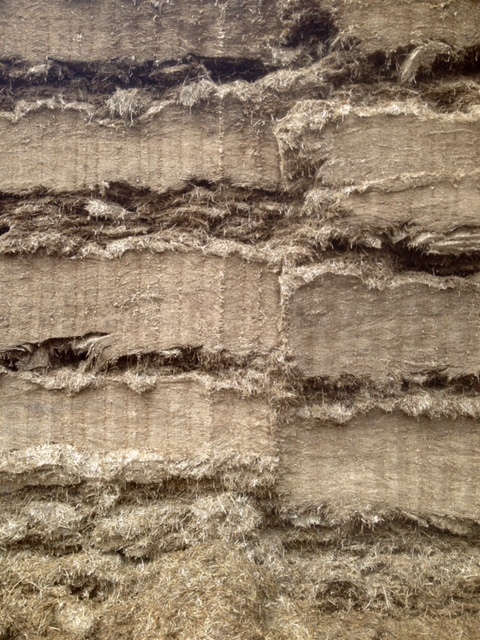 Before Christmas we were using the DVI cultures directly put into the milk tank. 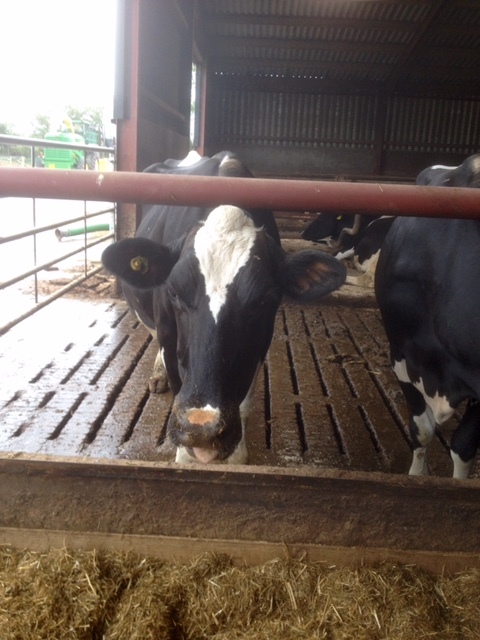 The milk is then piped across to the dairy at 7 or 7:30am depending on the acidity. On particularly cold days, Jonny might choose to keep the milk in the tank a little while longer as, once it gets to the dairy, it will be transferred into 8 tanks of 200l which will lose their temperature quicker than the insulated tank where it maintains a temperature of 34C. As with all cheeses there is a target range of pH to add the rennet at and if it will help to keep the milk incubating in the tank and send it across just as it’s ready to rennet then why not? Slowing the make down by losing temperature won’t help anyone. It takes about 20 minutes to fill all the vats and usually the aim is that they will be ready to rennet once the last vat is filled. While filling the vats, a 2 litre jug is taken out and a rennet test is done, which basically replicates the vat in miniature. By testing the flocculation time of the rennet test, you can assess what quantity of rennet to add to the vats. The aim is to flocculate in around 9 minutes and then the final set will be the flocculation multiplied by a factor of 5. In other words by just under an hour it will be at the right consistency to cut. The first thing I noticed after a few makes was that while the rennet test and flocculation test were religiously carried out, no one was testing the quality of the set before cutting. 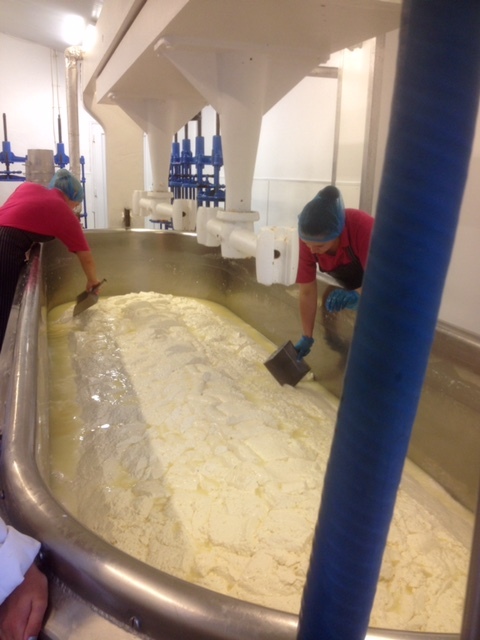 I’d been taught to check for a clean break in the curd and as time progressed with making their cheese I started to aim for the curd to have also come away from the sides of the vat (this tended to coincide with the clean break). To begin with, obviously, I observed and learned but after a week, I suggested testing the break in order to help the drainage later. This seemed to help. In October, we were moving from the early lactation milk with its high antibodies to mid-lactation milk, which would have settled down. September (before I got involved) had resulted in some quite quick maturing, wet cheeses that grew pink yeasts on the rind and tasted pretty great but had a very short shelf life: not a problem for some customers but difficult to handle for a lot of them. We were aiming for a more stable, longer maturing cheese now and trying to manage the last of the unruly milk to deliver that so drainage was key. The curd was cut smaller than usual with a couple of ‘harps’ (strung with wires to a specific size) rather than cutting with one harp and then with the knives as they had been doing before. 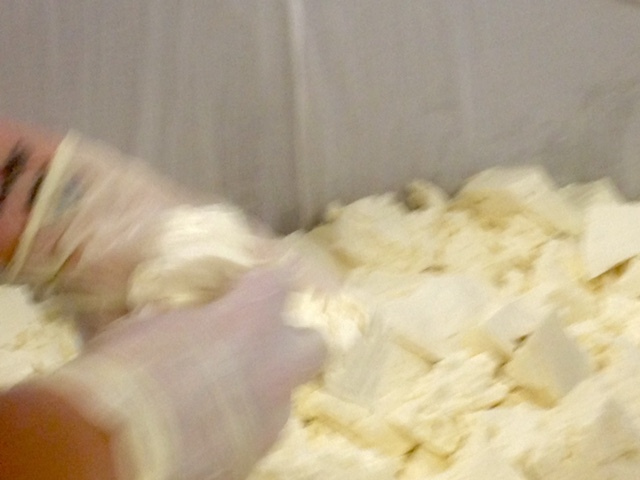 The curd was cut when a clean break and a certain amount of breaking away from the sides of the vat were achieved. It’s then left to settle and acidify for a bit. The aim is that the curd will have given off 2 to 3 inches of whey at the top of the vat but also that the curd will be at pH 6.2. Obviously the 2 things do not always coincide but that is the ideal. At this point it’s time to ladle. All this time, from 7am when the milk comes across the room is heated to at least 30C so the atmosphere is not causing the milk to lose temperature and the cultures to slow down. While Baron Bigod and indeed Brie de Meaux on which it is based require a certain speed of acidification, this is usually achieved in a matter of hours and the cheese is ladled by about 12 noon. The lactic set St Jude on the other hand is not ladled at the same acidity because the rennet used is significantly less. Where Baron Bigod (and indeed Brie de Meaux) are ladled at pH6.2 using a combination of the acidification shrinking the curd and the rennet shrinking the curd to cause the drainage, St Jude (and St Marcellin, its closest French equivalent) is ladled at the much more acidic pH 4.6 by which time the acidity is the primary shrinking and draining factor and the rennet just serves to allow the set to have consistency and help it on its way. 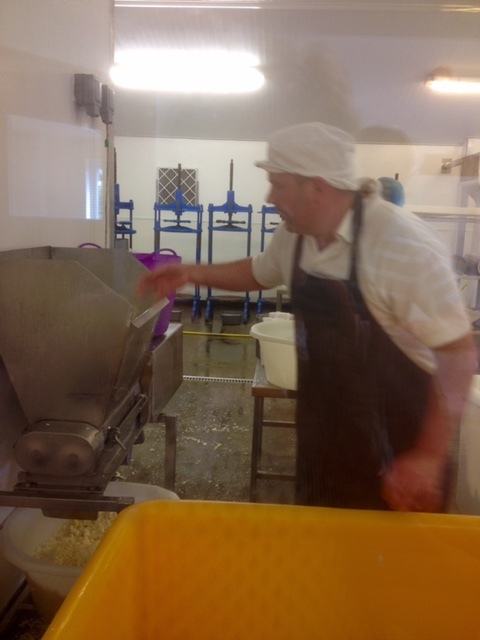 After ladling, the cheeses are left to drain and when the curd level has dropped to the correct percentage, the trays are turned. Each tray weighs 8kg more or less and it takes 2 trays when you’re turning: one that the cheese has been on and another that the cheeses are turned onto. The cheeses on that tray will probably weigh about 12kg at the first turn although this drains down to less on subsequent turns. The job is shared between 2 people but you lift with one hand and lower with another and you will do this around 80 times. You shift a lot of weight in this process and chances are you’ll do it 3 times before the afternoon is out. The cheeses drain for the afternoon and are turned 3 times. The aim again is to reach a pH of 5 at the final turn and that overnight it will be drained so well that it doesn’t drop below 4.8 or at the very least 4.7. Having tried to make a Reblochon recipe / Taleggio recipe at Nettlebed and with my own experience of over acidifying that particular recipe, I know that when we made cheese that hit pH of 4.8 or 4.7 (we were aiming to level at pH 5), it had a more Brie like consistency than the one we were aiming for. Hence I can believe that a Brie de Meaux aims for that sort of pH to stabilise at. Obviously it’s hard to hit the perfect pH but cutting small and aiming for the right set helps. But nothing is an exact science. Having tasted some Baron Bigod from the counter at Neal’s Yard Dairy and compared to some Donge Brie de Meaux on the Mons counter on my first Mons December shift, it was interesting to observe that the Baron Bigod was a lot more runny and liquid with obviously less calcium retained in the curd which hints at post acidification (ie after the make day is finished) where the Donge Brie has a more stable texture and buttery flavour. The flavour will be different from producer to producer and especially from one in the Isle de France compared to one on the Suffolk flood plains. However the retention of calcium can be compared and certainly for the retailer, while there is an excitement factor to a super runny cheese it is easier to handle and mature a more stable cheese, which retains more calcium. It can be matured for a longer time and this allows more nuance and more complexity of flavour in the paste. Certainly my comparison of Baron Bigod to Donge’s Brie showed that out. To be honest the Baron Bigod compared very, very well. It is, without doubt, the only Brie style cheese being made in the UK that can hold a candle to the French cheeses. However when it came to a comparison with an award winning French Brie from a small, family producer, it had a lot of flavour in the rind that wasn’t born out in the paste. The paste was super-runny and a little flavourless by comparison as if it had matured just a bit too quickly. The Donge was more subtle overall but the balance between paste and rind was more equal and indeed better. To be honest since after my initial tasting, I then spent my entire time selling French cheese, I can’t give you a rational analysis of what proportion of Donge Brie to Baron Bigod might get sold. However I do stand by my initial assessment and will be interested to see how the comparison develops.